The shortest way to your luxury recreation vehicle. VARIO quality check included. 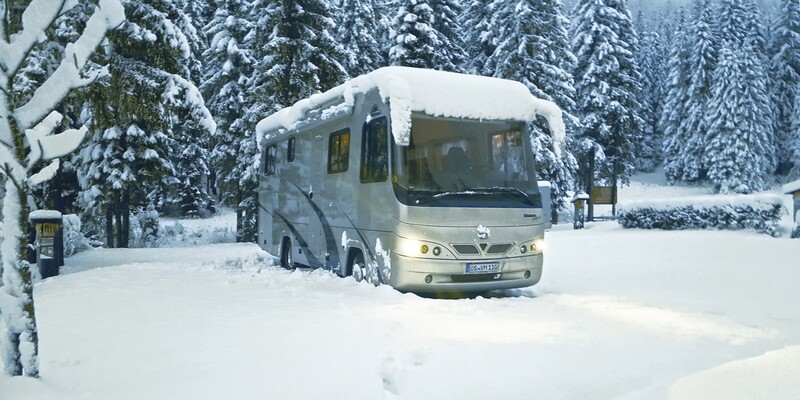 You do not want to wait long for your motorhome? All campers are checked and ready to ship. 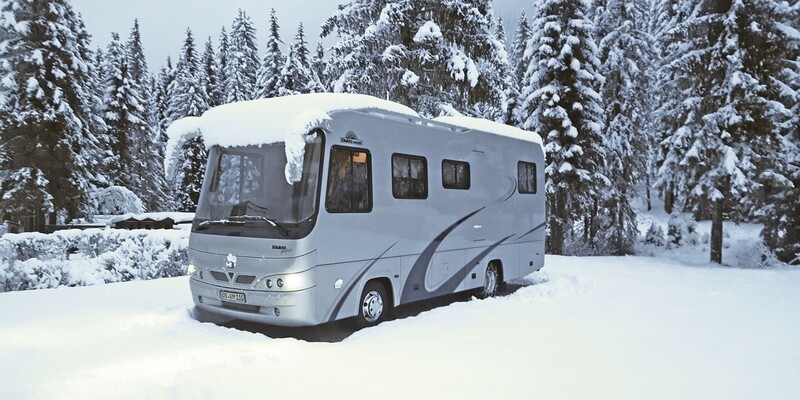 We are happy to welcome you here in Bohmte and show you your new motorhome. Mercedes-Benz Actros 2543 Volumer LLL. car garage with sliding platform for automatic car move-in of a MB SL Roadster or A-class, 3 axes, 3 slide outs, 2 - 4 beds, 10 seats. 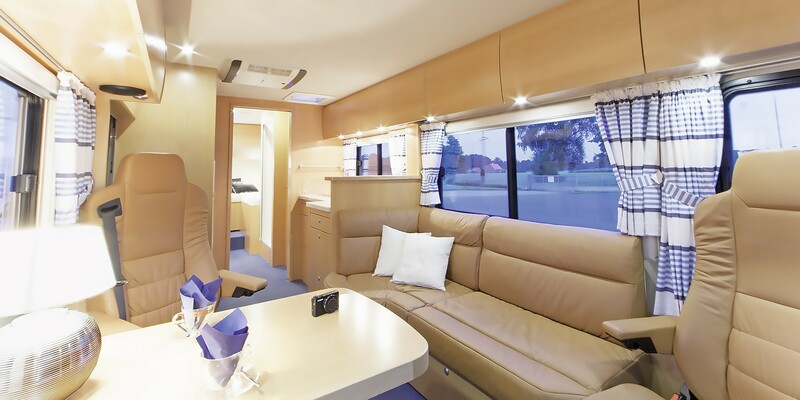 This most exclusive luxury 25 t mobile with three sided walkabke king size bed next to the new mirorred XXL wardrobe with e-Glide Sliding system provides in addition living environment in American Cherry "bentART" design combined with an attractive satin white. Here two people will feel good and appreciate the unusual atmosphere. Deserving are e.g. 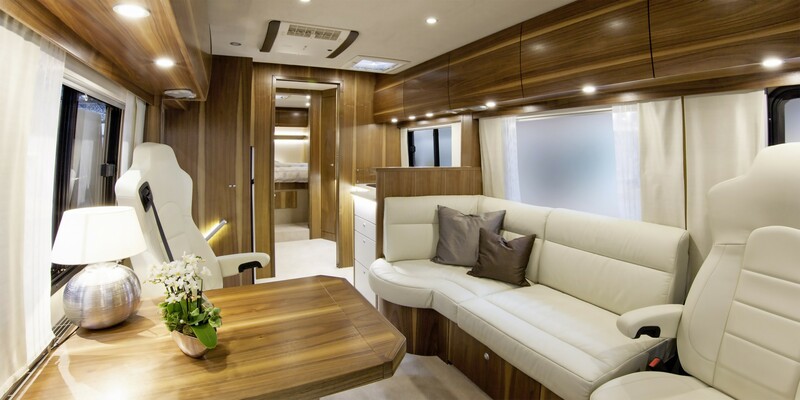 the spacious lounge with electrically adjustable captain's chairs, the comfortable driver's cockpit with multifunction leather steering wheel, separate dinette seating and the large spacious bathroom with "rustART" Design panel, as well as the design of light elements and indirect lighting possibilities. For futher information we refer you to the documentation following the gallery photos below. Excellent standard. With reasonable care. 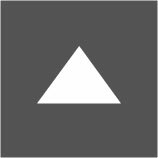 This website has been created with great care. 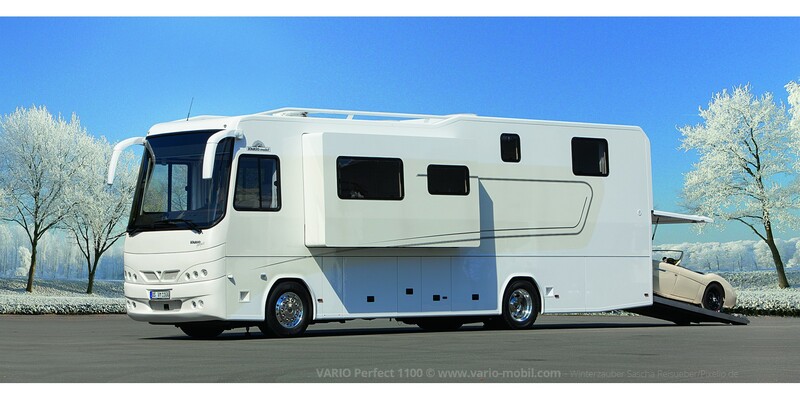 However VARIOmobil can not guarantee the absolute accuracy of the details and informations about all motorhomes. Internet sending-/receiving-LNB with SKEW Motion modem, LAN socket. TV and Internet simultaneously possible! 19 % VAT included. VAT reclaimable. Decorations, passenger cars and accessories not included. 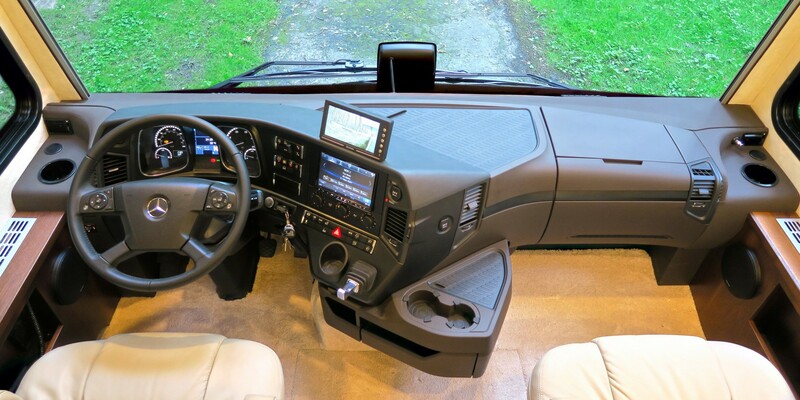 Exclusive two-person comfort mobile, 7.5 t, automatic. Minimal dimensions, maximum comfort. Agile travel property. satin white furniture flaps. Mercedes-Benz 923 L, GVWR 7.490 (9.500) kg. The classic from the compact VARIO Perfect series on Mercedes-Benz Atego impresses with only 8.6 m vehicle length, 231 hp, high-end technology, timelessly elegant GfK body and modern VISION design metallic paint. 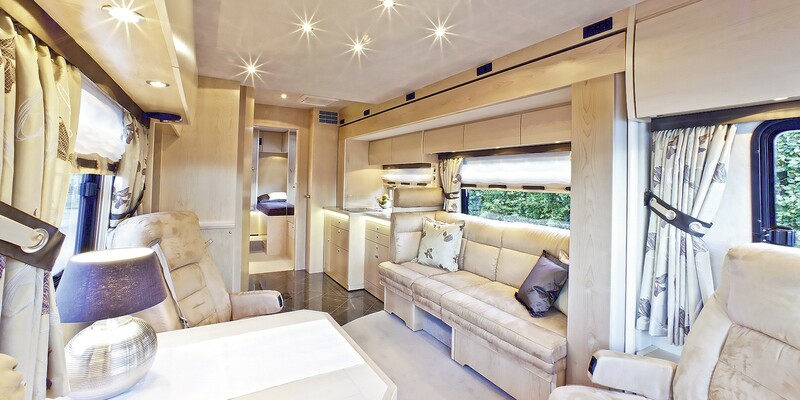 The luxury mobile offers despite agile outside dimensions maximum comfort in the interior. American walnut solid wood in "bentART" design contrasts with satin white furniture flaps, a comfortable lounge in sturdy thick leather creates a classic ambience. 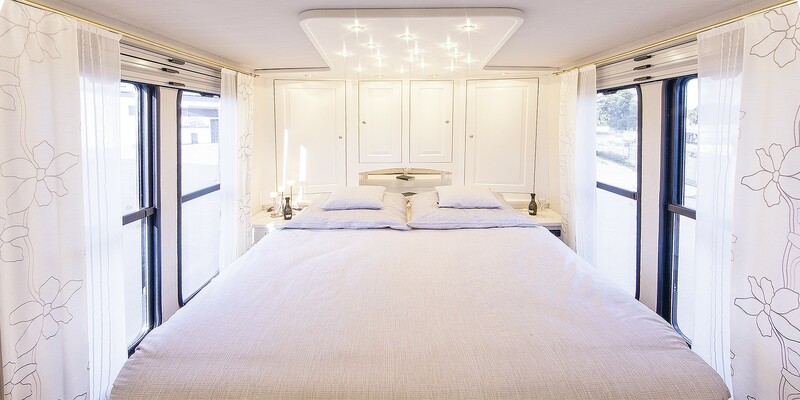 On board the two-sided walk-in queen-size bed, an exclusive bathroom, kitchen equipment and multimedia of the finest quality. 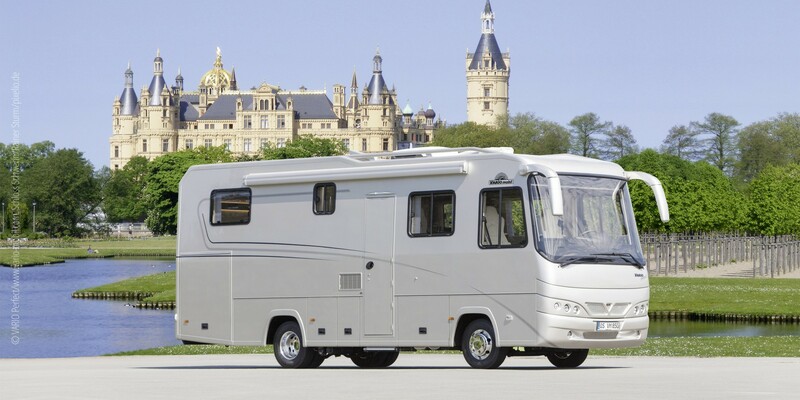 A registration as a 7.5 t motorhome is possible, as well as with load capacity friendly 9.500 kg gross vehicle weight. Please refer to the further equipment details of the extensive equipment list following the gallery photos. Modifications and mistakes are possible despite of the greatest possible care in assembling these documents of vehicle details. Exclusive road yacht for 2-4 persons. Car garage, XXL living room / Slide Out. Full air suspension, lifting / lowering device, automatic, hitch, hydraulic jacks. Excellent condition. To be delivered from first owner. MAN TGX 18.560 LL, first registration 11/2015, GVWR 18.000 kg. VAT not reclaimable. For sale on customer instruction. VARIO Perfect. 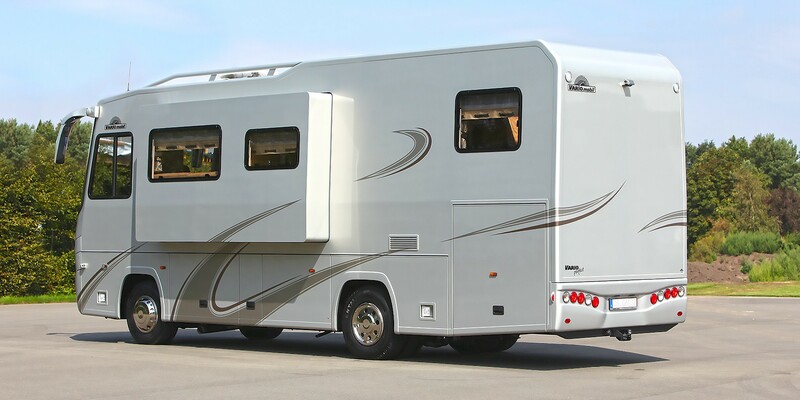 A class motorhome that wants to raise you up to your claim. Here you live in a light-flooded, spacious motorhome. A XXL living room with slide out. A car garage with free-sliding platform for BMW Mini or Toyota Aygo. This roadyacht offers more than an average recreation vehicle. Welcome to the VARIO Perfect 1050 SH. 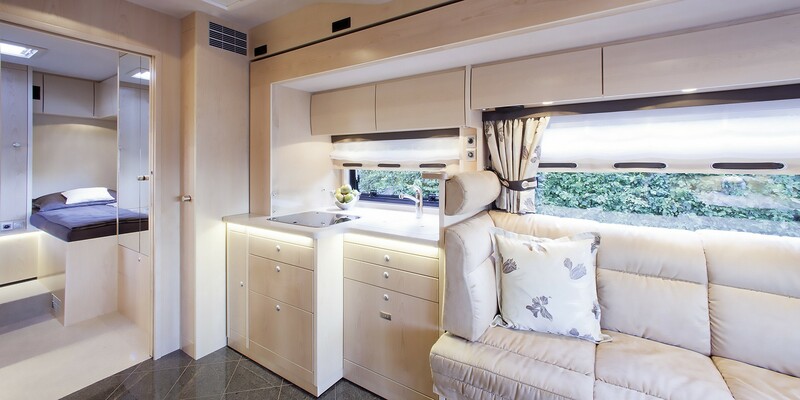 This particularly high-quality and powerful motorhome on MAN TGX 18.560 LL powers with 6-cylinder diesel engine and two-stage turbo. With chassis and steering this lion sets standards. 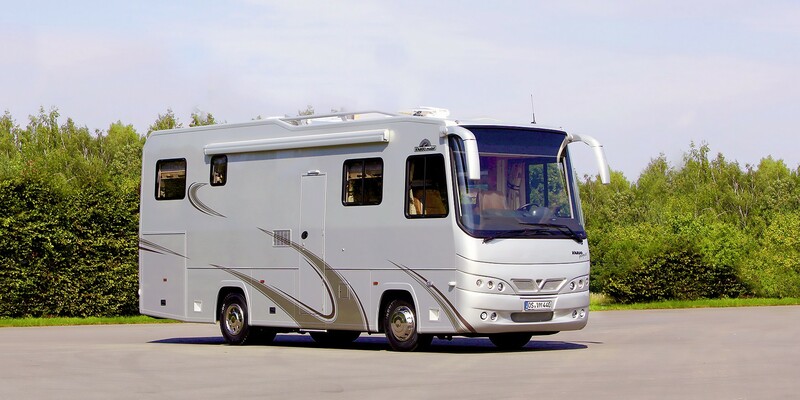 Equipped with car garage and retractable living room - bay window, driver assistance systems such as BRAKEMATIK, emergency braking system, distance-controlled cruise control, a multifunction leather steering wheel, 12-speed automatic transmission, 3.5 t hitch, hydraulic jacks and an impressive equipment list, this motorhome will be handed over from first owner. The outstanding features are the low mileage of only 28,000 km, the enormous load capacity for all the conveniences you want to have while traveling, the bright interior in straight-line 'vogueART' design exclusive maple wood veneer, the particularly spacious living environment with slide-out, leather upholstery, driver and passenger seat with massage and climate comfort, the gourmet kitchen with Miele refrigerator and microwave / hot air oven, induction cooker, dishwasher, removable freezer, JURA coffee machine, Dornbracht design fittings, the spa bath with walk-in real glass shower panel and Staron® back wall with inlays, natural stone counter top sink, 2x warm water diesel heaters Webasto Pro, with underfloor heating in the living and bath area, a full washer / dryer and a generator in the outer storage compartment. Another special feature of this vehicle is that it does not require a gas system. Charging current increase while driving, up to 12 V 110 A. Design 'Roadyacht', high quality metallic foil. This design is removable residue-free. Optionally, your individual desired design can be applied (surcharge). Decoration and BMW not included. OR HAVE QUESTIONS... PLEASE CONTACT US!